The third time was a charm for the Bellevue Wolverines girls basketball team against the Mercer Island Islanders. Bellevue, who suffered two defeats against Mercer Island during the regular season, registered a 49-45 triumph in the KingCo 3A championship game on Feb. 9 at Newport High School in Factoria. 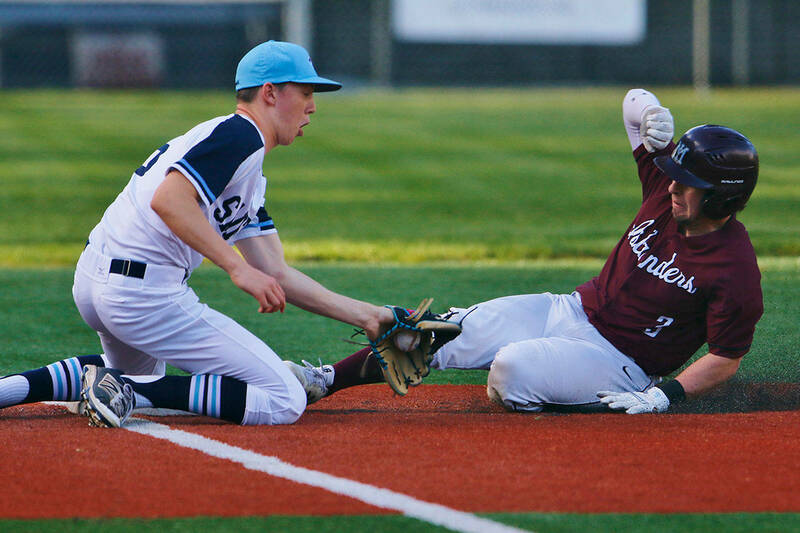 The Wolverines improved their overall record to 20-2 with the win, while Mercer Island dropped to 17-4. It was the Islanders first loss since their December trip to Arizona over the holidays. The championship matchup between rivals was a nail-biter in the fourth quarter. With the Wolverines clinging to a 44-43 lead, senior guard Ann-Marie Jacobs knocked down a 3-pointer with 36 seconds left in regulation, extending Bellevue’s lead to 47-43. With four-seconds left in the game, Mercer Island guard Clare Mansfield knocked down a difficult short baseline jumper, cutting Bellevue’s lead to 47-45. With 1.3 seconds left on the clock, Jacobs calmly sunk two consecutive free throws to seal the win for the Wolverines. As the final seconds trickled off the clock, the Bellevue cheering section erupted with a roaring applause celebrating the victory. Wulbert wasn’t surprised to see Jacobs knock down the clutch 3-pointer in a pressure packed situation. “She is just ice cold. She has done that a lot for us this season. Against Juanita, we were down by three with five-seconds to go. We drew up a play and it broke down. She hit a three from the corner and just walked away like it was nothing. She is used to the big moments,” Wulbert said. Jacobs credited Bellevue post players Kathryn Roberts and Kate Parrish for their defense on Mercer Island star post player Anna Luce. Luce scored a game-high 30 points but Bellevue’s two interior defenders did everything they could to try to slow her down. “We knew Anna was going to get her points but our main goal was to just box her out and make sure it was hard for her to get the ball. They (Roberts, Parrish) played really hard defense on her. We got the boards when we needed to and we just pulled through,” Jacobs said. Parrish had 12 points in the win and Roberts unleashed a key block on Luce in the final minute of play. Mercer Island head coach Gillian d’Hondt said her team didn’t play like its usual self against the Wolverines. In the fourth quarter Mercer Island guard Jessie Stenberg had three key steals, keeping Mercer Island’s chances of victory alive down the stretch against Bellevue. The Islanders will play in a loser-out Class 3A SeaKing district II playoff game at 7 p.m. on Feb. 11. d’Hondt is confident her team can rebound from the setback against Bellevue. “It is just a matter of tweaking a couple of things offensively. Bellevue came with a great game plan and they played some really good basketball,” she said. The Wolverines will play in the Class 3A SeaKing district II playoffs at 6:30 p.m. on Feb. 14 at Bellevue College. Jacobs is excited about her team’s opportunity to attain success in the playoffs. The Wolverines, who won the Class 3A state championship last season with a perfect record, have an entire new starting lineup this season.